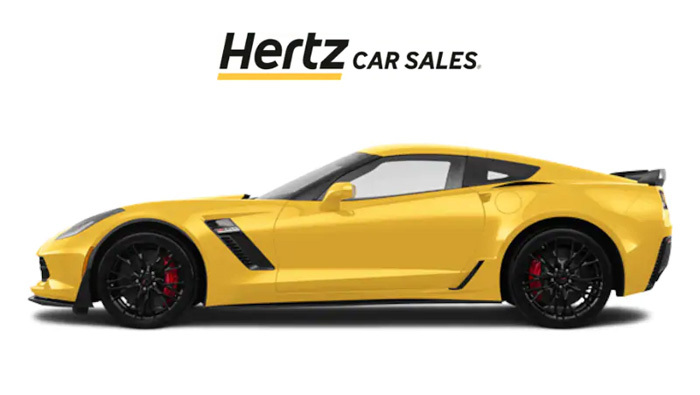 Those in the market for something a little more limited-edition than a standard C7 Corvette Z06 will be delighted to know Hertz has a sports car for you. Following the car rental service’s 100th anniversary celebrations, it’s selling 100 C7 Corvette Z06 Hertz edition models. According to Corvette Blogger, Hertz purchased the cars and had them outfitted with special badging to celebrate the company’s 100th anniversary. With the party over, it’s time to let the sports cars go. They were previously available to rent at a number of U.S. airports. Each Corvette features Corvette Racing Yellow paint with black stripes and black wheels. Not coincidentally, the colors match Hertz’s corporate colors. The cars also feature yellow brake calipers and competition seats. Hertz badging is present inside, which includes a centennial plaque marking the car’s production number as one of 100 cars. The company hasn’t placed the cars for sale just yet and said fans should watch the website to see when the Corvettes are listed for sale. Once the cars surface for sale, buyers can begin the process via an online application before moving on to financing. Of course, each of the cars will have some mileage on them. They were rental cars, after all. We’d also imagine more than a few of them had some abusive times with drivers looking for a quick whip on their vacation. What do YOU think, over or under used retail sales price?